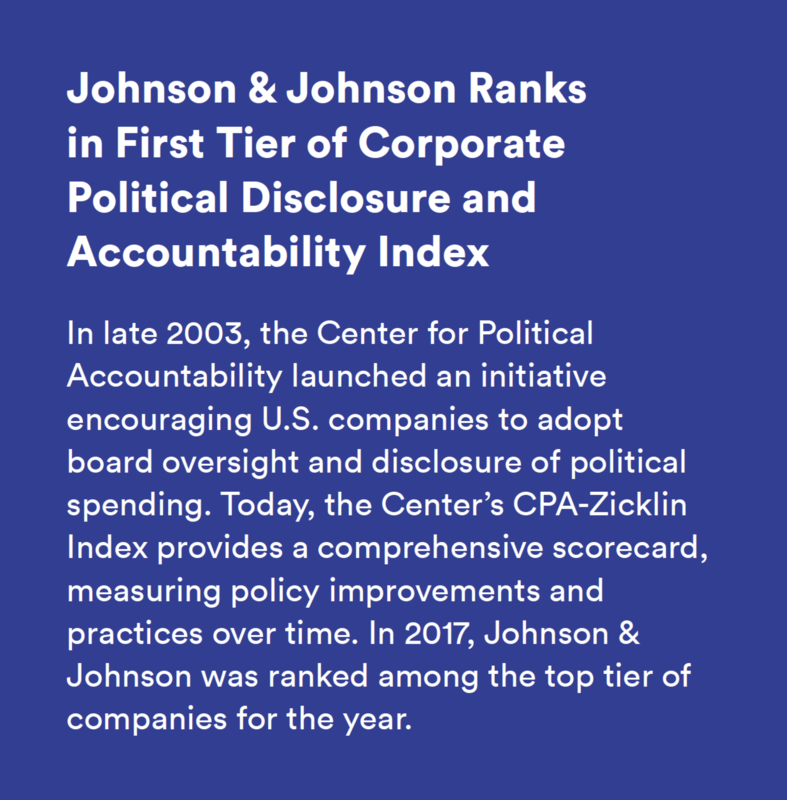 At Johnson & Johnson, we strive to hold ourselves accountable by providing information about how we operate across our operating companies and markets. Internally, we view this as an opportunity for continuous self-reflection and improved risk management. Externally, being open and transparent helps us maintain the invaluable trust of our stakeholders in the strength and health of our Company. The information we share includes mandatory and voluntary disclosures, such as financial disclosures in the Annual Report/10-K; payments to healthcare providers; sustainability disclosures in the Health for Humanity Report; environmental disclosures through CDP; and drug pricing and other practices relevant to our U.S. Pharmaceuticals business in the Janssen U.S. Transparency Report. We disclose information through various channels, including public securities filings; press releases; our corporate website; operating websites; the annual Health for Humanity Report microsite; and various forms of media. We regularly report on our financial progress and other material disclosures as required for a U.S. public company by the Securities Exchange Commission (SEC) and the New York Stock Exchange. Our financial performance results at the enterprise level are disclosed in our quarterly and annual reports filed with the SEC and are available on our corporate website, which you can reach by clicking here. We have a long history of public reporting on environmental performance. In addition to providing data and information in our sustainability reports, we participate in CDP, a global disclosure system on environmental issues. We have been reporting energy consumption, greenhouse gas (GHG) emissions and water consumption data through CDP for several years. We achieved a rating of A- for our 2017 CDP Climate Change Report and received a B rating from CDP for our water efforts. In 2016, we piloted the CDP’s Forest Disclosure Project to assess and share how we are managing our value chain’s impact on at-risk forest resources. We also support enhanced disclosure of climate-related risks and opportunities, as recommended by the industry-led Financial Stability Board Task Force on Climate-related Financial Disclosures (TCFD). Our 2018 CDP Climate Report will include enhanced disclosures based on TCFD recommendations. Ethical relationships with healthcare professionals are a critical part of developing and marketing healthcare products. We are committed to being open about relevant financial aspects of our interactions with physicians, medical scientists, hospitals, other healthcare professionals and the healthcare organizations. In the United States, we disclose financial information under the Physician Payments Sunshine Act (commonly known as "Sunshine Act" or "Open Payments"). In addition to information posted on the Centers for Medicare and Medicaid Services, and in an effort to provide the most accurate and timely information, Johnson & Johnson has voluntarily posted aggregated data for our companies covered by Open Payments, as submitted on March 31, 2017. Outside the United States, we disclose similar information in those countries or regions where standards or requirements for disclosure have been established. For instance, in Europe, the Middle East and Africa, we support the European Federation of Pharmaceutical Industries and Associations (EFPIA) “Code on Disclosure of Transfers of Value from Pharmaceutical Companies to Healthcare Professionals and Healthcare Organizations,” and are complying with those requirements (for more information, visit the Janssen website). Other countries or regions have similar legal or industry code disclosure requirements that we have worked to help establish—and that we comply with—to help foster transparent business practices. For more information on funding to healthcare professionals and for professional education, see our statement. Clinical R&D is critical to advancing the trajectory of health for humanity. We believe transparency of clinical trial data advances science and medicine, and is in the best interest of the patients who use our products and the providers who prescribe them. We support the overall principles of greater clinical trial data transparency, including registration and disclosure of clinical trial results in external registries; publication of results in peer-reviewed journals; and sharing of clinical study reports and participant-level data from clinical trials. We strive to ensure we are delivering quality products while keeping in mind healthcare costs, particularly for prescription medications. We recognize that in an increasingly complex healthcare system, patients are concerned about their ability to access and afford the medicines they need. To help patients and other stakeholders understand our approach to pricing medicines, in 2017 the Janssen Pharmaceutical Companies of Johnson & Johnson published the inaugural 2016 Janssen U.S. Transparency Report. It demonstrated our commitment to responsible business practices that put patients first, providing a window into our responsible approach to pricing, how we invest our resources, and how we help people who need Janssen medicines get access to them. The 2017 Transparency Report, released in March 2018, goes into more detail, expanding on our approach to clinical data transparency, value and pricing, access support, and sales and marketing. We provide even more information on our R&D process, the value of medicines, and the advantages of moving to a more results-based healthcare system. As the latest report shows, in 2017 the net price of our medicines in the United States decreased, while we increased our investment in discovering and developing transformational medicines for patients facing some of the world’s most challenging diseases. We issue this report because we believe open dialogue is essential to developing a more results-based healthcare system that delivers what we all want: greater access to care, at more manageable cost, and most importantly, better health for all. As a multinational healthcare company, we work with many stakeholders in the markets where we operate, and we take a stance on and support certain public policies in the United States and in different parts of the world as they relate to our core business of advancing health. Our stakeholders express interest in knowing what our policy positions are and who we support. We disclose this information annually, including our philosophy on political contributions, our strategic priorities and our contributions data. Please visit Political Contributions for more information.